The Man Who Stares At Screens: Double Take (2009) - or why Alfred Hitchcock is to blame for the cold war. 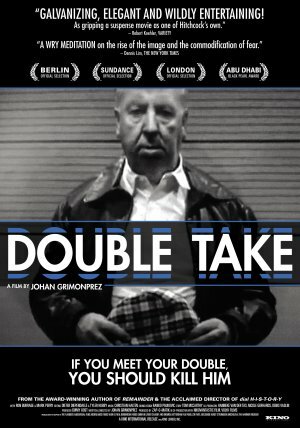 Double Take (2009) - or why Alfred Hitchcock is to blame for the cold war. Okay I know! I'm like buses, no posts for nearly a year then two come along at once, but whilst I've regained my blogging mojo I just had to mention this little gem I discovered a few weeks back whilst browsing the net for interesting and unusual filmic fodder and this one certainly fulfills both those caveats. Double Take is a 2009 Belgian-Dutch-German financed production directed by Belgian Johan Grimonprez, which according to it's Wikipedia stub is best described as an essay film. It certainly is a hard movie to classify, it being a strange amalgam of fiction, documentary and stock footage that weaves a fantastical tale around a visual history of 60's cold war media coverage, advertisements and footage from Hitchcock's film and TV work, interspersed with snippets from the life of a modern day Hitchcock impersonator which come together to form a hypnotic, witty, competent and surprisingly cohesive essay on the duality of truth, the nature of modern media and it's ability to manipulate fear as a socio-political tool. The main premise of the film is a story about Hitchcock, who, whilst filming The Birds walks into a room off-set to discover an older looking double of himself who claims to have come from the future (1982 to be precise). The ensuing conversation between the two doppelgangers forms the narrative backbone of an extended montage of entertaining and eclectic footage that builds to form the films core argument whilst also touching on higher concepts such as the nature of reality and truth and the usual conundrums that naturally occur whenever time-travel rears it's abstruse head. I titled this entry Why Alfred Hitchcock is to blame for the cold war, but that's not really fair as this is not what the film is trying to convey, I have simply taken the liberty of extrapolating Grimonprez' argument to it's logical conclusion. The film refers heavily to the concept of the Macguffin a narrative device that Hitchcock himself was oft fond of using in his filmaking. I believe that Grimonprez is suggesting that the central axiom of the cold war ie, the threat of mutually assured destruction was itself a giant macguffin used to direct social and political policy with the mass media implicit as chief manipulator on both sides of the iron curtain. Whatever conclusions you draw from this intriguing work what you experience will be like nothing you have seen before, a compelling and charming piece of cinema drifting on that rare cloud where documentary meets art. Highly recommended.